Concur Technologies is in talks to be acquired by ERP giant SAP, Bloomberg News reported late Tuesday. 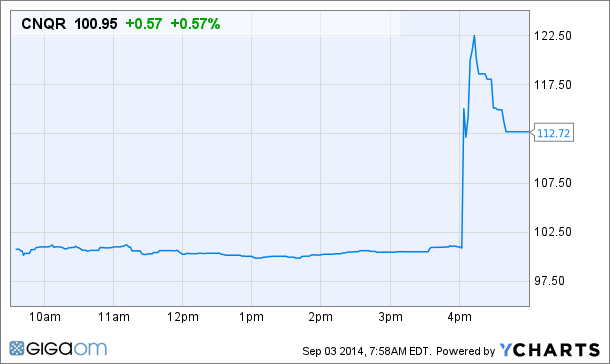 Concur share prices spiked as a result, surging more than 20 percent in after-hours trading Tuesday to $122.13. The Bloomberg report cited several unnamed sources who said the Bellevue, Washington–based [company]Concur[/company] approached [company]SAP[/company] as well as [company]Oracle[/company] and [company]Microsoft[/company], although one source said Oracle was not interested and that Microsoft was not in the market. None of the companies commented. It would make sense for Concur to try to cash in on the big enterprise software companies’ buying binge — it provides SaaS-based expense report and travel management services for businesses. In the past year SAP, Oracle, Salesforce.com and others have bought up specialized point products to fill gaps in their business software portfolios. SAP, for example, bought Fieldglass, a software company for managing temporary or contingent workers, in 2012. In 2011, it acquired SuccessFactors for its human resources management capabilities for about $3.4 billion in cash, as part of a push to add vertical SaaS applications to its portfolio. Very interesting, thanks. Now that the Concur deal is done and dusted, what other can be in the pipeline before the end of the year?